This book is really funny, but you have to go to a dark, dark place before you can laugh. It's body-parts-in-a-woodchipper humor. The narrator John has worked for Human Resources, Inc. since he was a teenager, but his job description isn't what you might think. He and his coworkers are young assassins, placed as interns in high-profile offices to gain access to targets. HR Inc. has locked into this strategy because no CEO or senior partner can ever remember the name of a faceless intern; it's the perfect cover. John is writing his “Intern's Handbook” to share with new hires, so they can learn from his experiences. He writes about his last assignment as a sort of sample case. He'll be an intern at a prestigious law firm, with the goal of taking out one of the partners. Unfortunately for John, things go wrong from the very first day and get worse from there. John isn't even sure which of the partners he is supposed to kill, and the girl he meets on the job and starts dating turns out to be an FBI agent. He doesn't know who he can trust until literally the last page. John is a little like Jason Bourne, but without the sunny disposition and steely conscience. His horrific childhood, spent in foster homes and juvenile detention, tailored him perfectly for a life of homicide. He's an efficient killer, but not quite as emotionless as he probably should be. His judgment is clouded by Big Feelings, specifically those inspired by his unknown, absent parents and his FBI love interest, Alice. Even though his heart isn't completely dead, he's not a likable guy and he's not trying to be. He's violent, angry, misogynistic, cocky, and really freakin entertaining. Sure, there are plot holes here, and a few scenes that strain credulity. I found I could forgive those flaws because I was so taken by the creative premise and darkly funny voice. John may take himself seriously, but it's clear that Kuhn doesn't, and that lightness keeps the book from being just another action movie on the page. 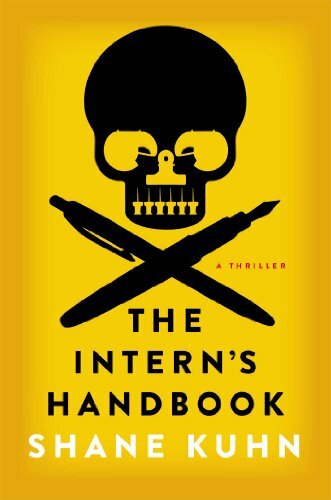 The Intern's Handbook is more Coen brothers than Michael Bay. Yes, there's blood and guts and gore, but the violence isn't an end in itself. All it does is serve as a medium for the wicked playfulness of Kuhn's imagination. If you're picking up this book just to watch stuff blow up, get ready because your mind is next.